It’s been an all-too-common sight at Great American Ball Park: a young stud pitcher taking the mound, awesome in his own rite but forced to waste away on a terrible team. But for a change, we’re not talking about a Red. 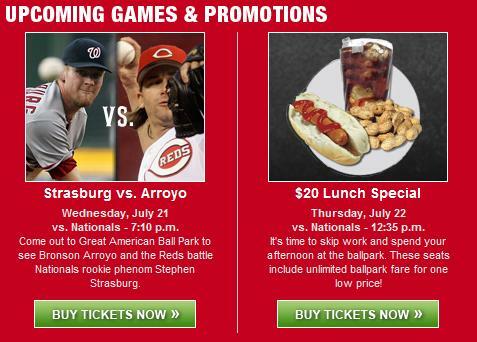 Tickets are going fast for Wednesday’s game when Stephen Strasburg leads the Washington Nationals against Bronson Arroyo and the Reds. I clicked the Buy Tickets link and the “Best Available” option that was presented to me was section 303. Gets yours now if you want to make it to this game. I only left the All-You-Can-Eat Seats ad in the screen grab because I can’t believe they’re still using that graphic. That must be the least appetizing picture of food ever put together by a Photoshop-challenged intern. Posted in Adam Dunn, Cincinnati Reds, Random Ramblings.